Jessica Simpson Carlin Reversible Bath Rug (21 x 34). 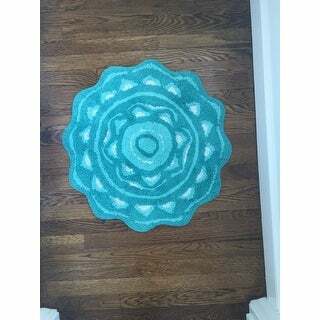 Jessica Simpson Bloom Shaped Bath rug 26x28. Enhance your bathroom decor with the Jessica Simpson Medallion Bath Rug. 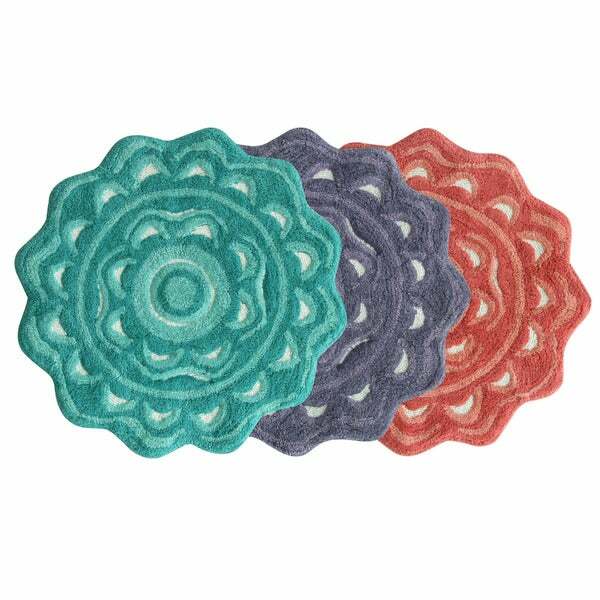 This rug features a soft and absorbent 100-percent cotton construction with a round medallion design in coral, purple or aqua. Purchased two of the coral and one of the teal for my daughters bathroom. From reading the reviews I knew they were smaller... made measurements and thought it would be cute to have them staggered on the floor. Her bathroom theme is Britto and the bright colors complement the pop art work. Initially gave them four stars because they had a slight damp musty smell like they had been sitting in a warehouse for a while ( which they probably have). Upon washing them (because of the smell) they shed pretty bad. Lint and little frayed pieces that I had to trim level again. For the look and the price the rugs are really cute. These plush rugs are great for small bathrooms. The color doesn't "pop" as much as I had hoped, but overall very good quality. 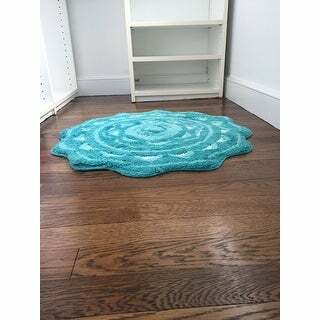 I purchased this rug along with the Bali bath rugs by Jessica Simpson. The purple colors definitely work together. All rugs need a rug pad since they slip on the tile. The rugs are a good quality. I love the quality, the color and the shape of this Jessica Simpson bathroom rug. I am going to order 2 more today. This bath rug is the perfect size for my bath. The round shape with a scalloped edge stands out in a drab bathroom. The color is outstanding and extremely brilliant. Beautiful, bright colors. Matches the Jessica Simpson counter accessories really well. Really brightens up my master bath. Totally love the color. The pic doesn't do it justice as far as bright coloring. The design, quality and color is fabulous. I am using the aqua mat in a small half bath with an ocean theme, and it works well with the decor. Would have gone with turquoise probably but am satisfied with what I have!!! So adorable!!! Perfect for my daughters bathroom!! I don't know what made me buy this. I've never used it. It's ok - it looks exactly as pictured, decent quality - just not my speed. Impulse buy. 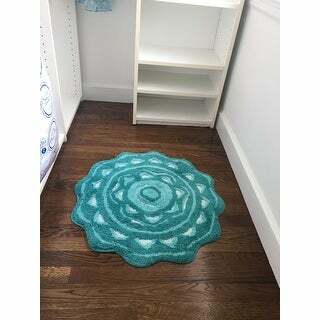 Rug goes perfect in our bathroom. Love the pattern and color. I like the colors. The rugs shed a bit. I have yet to launder them so the jury is still out. The color is more green than teal. It didn’t match my dark teal powder room so I am using it in my daughter’s closet. It doesn’t make sense with shipping to return it. It’s cute enough. I really like the color of this rug and the size is perfect. It is soft and feels nice under foot. However, I do not like that this rug is not rubber-backed. I cannot use it without a liner or it slips all over the tile in the bathroom. It's a safety issue. I almost fell the first day I received it. Had I known this "Bath Mat" did not have a rubber backing I would not have purchased it (even if it is pretty). "How think is this rug? I need a thinner rug for my door to cross over. I love these." This rug is .36" thick. I love the rug, it is exactly what we wanted. This is a plush rug, I don't think a door will close over it. "why are there two answers to the "non-skid" backing? One says yes it does have "non-skid" and one says no it does not have "non-skid". Thanks"
There is no "rubberized" backing. I agree, the back is not rubberized but nicely woven. It surprisingly doesn't slip. It is a beautiful rug. Mine is now about 6 months old. It had been washed several times. The color is still great. I love this rug. There is no rubber backing, and mine did slip. I purchased non-slip padding and cut it to fit underneath. It's good now. I'm thinking whether or not it slips depends on the type of flooring you have. I have vinyl linoleum flooring. "Does it have the non slip/slide backing?" Yes, it does have a non slip backing. the aqua color matches my bathroom. Bloomfield Bath Rug Round 28"x28"